Founded in 2003 in Germany watchmaker Alexander Shorokhoff a new model – Stripes. She is the epitome of watchmaking and the avant-garde movements in art which so vividly represented in the works of the German artist Gunter Frutrunka (Gunter Fruhtrunk). The style of the artist was greatly influenced by the work of Malevich. His original paintings generate accurate images, which are replaced by the story of stylistic means of expression. The same idea is characteristic of novelty Stripes, whose face is decorated with alternating bands rhythmically, successive bursts into color and overall harmony two circles. Clock, equipped with dual time function, have a non-uniform aesthetics, in which Russian merge creativity and precision of German descent. 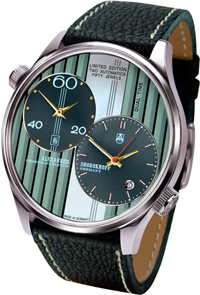 Stripes model is 47 mm round case that houses an automatic caliber with hand-engraved. The work of the fire can be seen through the sapphire crystal, mounted on the rear of the chassis.